The Bangong-Nujiang suture zone lies in the central part of the Tibetan Plateau. It is not only an important plate suture zone, which has direct controlling effect on magmatic activities and tectonic evolution of South Qiangtang and North Gangdese, but it is also an important metallogenic belt. Its tectonic evolution is closely related to the evolution history of the whole Tibetan plateau. In this paper, zircon U-Pb dating of the acid intrusive rocks in Lhaguo Tso has been conducted. Chronologically, the rock types are medium-fine-grained granodiorite (γδaK1) → medium-grained granodiorite (γδbK1) → fine-grained biotite adamellite (ηγβaK1) → medium-fine-grained biotite adamellite (ηγβbK1). The formation time ranges from 113.7 to 100.3 Ma, and the magmatic activity is concentrated in Lower Cretaceous, coincided with the Lower Cretaceous magmatism of the Northern Gangdese terrane. The intrusive rocks in the research area are characterized by high silica (SiO2 = 59.96~78.03%), potassium-rich (K2O = 2.04~4.71%), alkali-rich (K2O + Na2O = 6.08~8.5%), peralkaline to peraluminous (A/CNK = 0.89~1.25), and high calc-alkaline to shoshonitic. The intrusive rocks in each stage are obviously enriched with LREE and high field elements (such as Th, Ta, Hf), and relatively depleted large ion lithophile elements (such as Ba, K, Sr). Total REE ranges from 82.53 × 10−6 to 203.91 × 10−6, with LREE/HREE of 82.53 × 10−6~203.91 × 10−6, (La/Sm)N of 1.68~14.77, (Gd/Yb)N of 0.92~1.84, and middle negative Eu anomalies (δEu = 0.07~0.94). Based on the above discussions, we propose that the geochemical characteristics of these intrusive rocks are consistent with those of arc-type magmas worldwide. 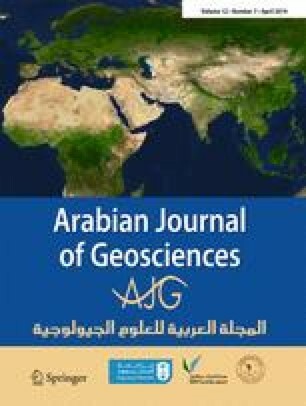 Comprehensive research shows that Lhaguo Tso intrusive rocks in the Bangong-Nujiang Tethys ocean crust of southward subduction background, formed in a typical island arc tectonic background, suggesting that the Bangong-Nujiang ocean in the Lower Cretaceous (113~100 Ma) is still under the southward subduction of the Northern Gangdese terrane, may not have been closed. We are grateful to all members of the 1:50000 regional geological survey of Nieercuo for their work. We thank Prof. Zeng for help with the manuscript. Finally, we thank two anonymous reviewers and the editors for insightful comments that improved this paper. This research was supported by the program of China Geological Survey (DD20160026).